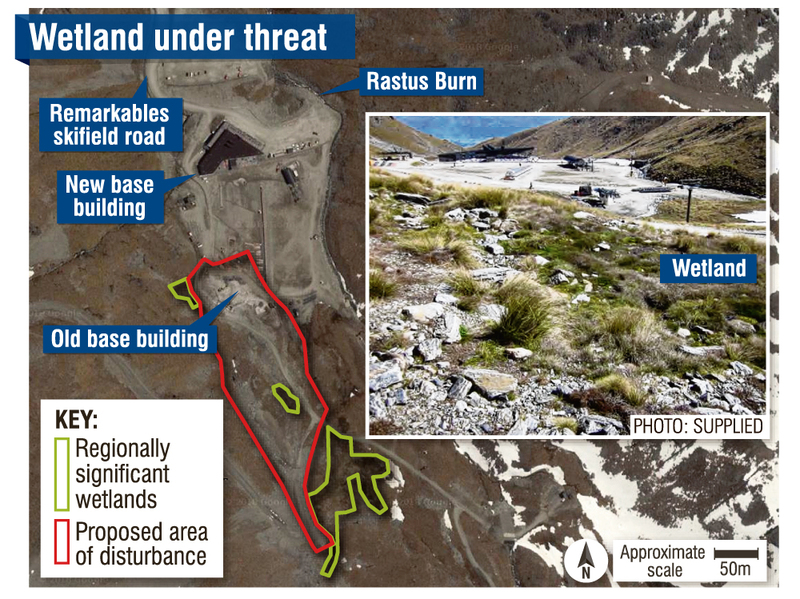 The Otago Regional Council granted consent for a Remarkables skifield extension on a protected wetland without notifying the public, documents reveal. The decision not to publicly notify went against the advice of both regional council and Department of Conservation reports. The council's regional science unit report said the project would mean the "wetland itself will be lost forever", and it had "to be considered more than minor". This would require the consent to be publicly notified. The wetland, under the council's own water plan, was considered "regionally significant", due to its location and altitude. An internal Doc report by ecology technical adviser Brian Rance, dated January 25, said the project would "result in the irreversible loss of the ecosystems present". "The ecological values are of significance and the impact on these values is high." He also said the consent should be publicly notified. Doc gave permission despite many concerns noted in the report. On March 22, the council granted land use consent to NZSki Ltd to extend its learners slope at the skifield. The project involved extending the existing learners slope, including the construction of two surface escalators, as well as track access to Shadow Basin. The consent was not notified. The consent decision leant on a clause in the plan allowing the effects if the work was "nationally or regionally important infrastructure". Much of the work was completed earlier this year, but a conveyer lift will be added in the summer. The work site is next to two other regionally significant wetlands the applicant stated would not be affected. Forest and Bird Otago and Southland central regional manager Sue Maturin said the organisation was "dismayed" the consent was not notified. "It seems like the consent was rushed through against the advice of both Doc and ORC technical experts." The project was "clearly not" regionally significant infrastructure, she said. An internal regional council report suggested on Friday, March 16 the council was still considering whether to notify the consent, four working days before the consent was granted, she said. "We're a bit shocked about that." Council chief executive Sarah Gardner said she stood by the report's argument the extension of the slope was "regionally important infrastructure". The regional science report which said the effects would be more than minor "did not contain a full assessment of matters required by the Resource Management Act", she said. She was confident in how the council conducted the consent process, Ms Gardner said. "I hold delegation to make these decisions and draw on my extensive 20-plus years of experience working as a qualified planner at regional, city and government level to assist me when I make these decisions." NZSki chief executive Paul Anderson said the advice it was given in a report it commissioned was the impact would be minor, and it was confident in that. The organisation did a "huge" amount of replanting of native plants during projects like this, he said. While the wetland would be lost, there were "thousands of square metres" of wetlands within the wider area which it wanted to protect, he said. The company also propagated seeds and did a wide range of weed control, he said. Its door was "always open" to environmental groups to discuss how it could save biodiversity in the area, he said. Take the members of the ORC round the back of the building and shoot them. This is unforgivable. In the meantime close the field for the season to teach the company some respect.